Large size could prove fatal. Summary: The Verbatim Ergo Wireless Mouse is a great choice in every aspect. The convenient thumb support puts your hand on a first class flight across your desktop. A scroll-wheel with almost no resistance makes computing a breeze. 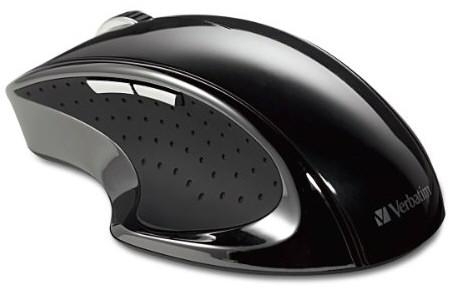 The entire mouse moves seamlessly on almost any hard surface. The Verbatim Ergo Wireless Mouse is definitely on the brink of greatness. An everyday computing mouse can’t get much better than this. 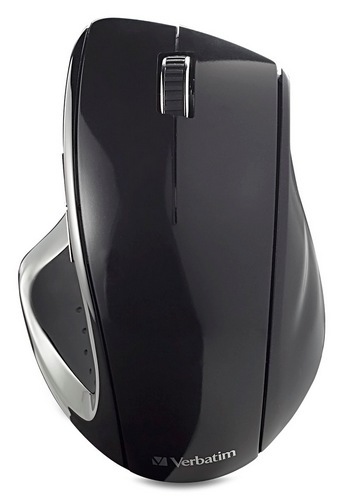 The Verbatim Ergo Wireless mouse has an average response rate of 2.4 GHz. You can't ask for much better of a response out of a wireless mouse, simply because of it’s small receiver size. If one wanted a faster response from the mouse, the size of the receiver would be sacrificed. This is a top view of the Verbatim Ergo. It shows the single plastic piece of the mouse. A slot down the middle makes for a happy trigger finger. Photo courtesy of Verbatim. The material feels very comfortable in the hand. The top of the device is a single piece of plastic with a split in the middle. This is to differentiate the left and right clicks. The hard plastic that fits in the palm and the rubber grip for the thumb support couldn't be more comfortable. It is truly an outstanding design. The scroll wheel is made of a rubber and feels surprisingly natural. I have found that the placement of the scroll wheel is just right for my hand. With many of the other mice that I have used, the scroll wheel has been either too far to the front or back of the device. This could just be that I have an odd size of hands, but I was pleasantly surprised with the placement of the scroll wheel. This wheel can also be clicked to bring up the dashboard, (Mac), or programmed to anything (Windows). Just off the top-left side of the device are two extra buttons. When using Windows, these buttons can be programmed to whatever you please. When using a Mac, the front button serves as a left click and the back button is an exposé function. This could be a flaw in the device. The extra buttons are not programmable when using a Mac, but the pre-programmed functions are, surprisingly, how I would have set them up, had I had the option. This view shows the size of the wireless receiver. It is much smaller than I would have expected, and fits easily in a laptop bag. Photo courtesy of Verbatim. The part of the Verbatim Ergo Mouse that makes it unique is the thumb support. When I first received the mouse, I wasn't sure if I would like it. However, after all the time that I have spent with it, any mouse feels incredibly awkward without a thumb support. The thin sheet of porous rubber gives great grip. It satisfies in either an intense game when you need to clench the mouse tightly, or when shifting through a webpage.